R = rotx(ang) creates a 3-by-3 matrix for rotating a 3-by-1 vector or 3-by-N matrix of vectors around the x-axis by ang degrees. When acting on a matrix, each column of the matrix represents a different vector. For the rotation matrix R and vector v, the rotated vector is given by R*v.
Construct the matrix for a rotation of a vector around the x-axis by 30°. Then let the matrix operate on a vector. 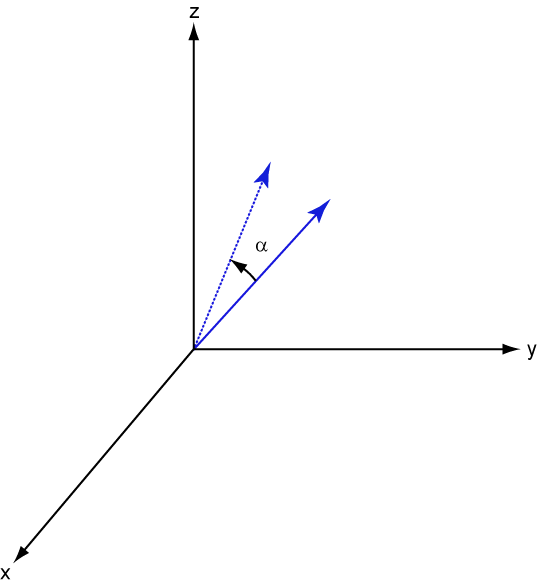 Under a rotation around the x-axis, the x-component of a vector is invariant. Rotation angle specified as a real-valued scalar. The rotation angle is positive if the rotation is in the counter-clockwise direction when viewed by an observer looking along the x-axis towards the origin. Angle units are in degrees. for a rotation angle α.
Rotation matrices are used to rotate a vector into a new direction. In transforming vectors in three-dimensional space, rotation matrices are often encountered. Rotation matrices are used in two senses: they can be used to rotate a vector into a new position or they can be used to rotate a coordinate basis (or coordinate system) into a new one. In this case, the vector is left alone but its components in the new basis will be different from those in the original basis. In Euclidean space, there are three basic rotations: one each around the x, y and z axes. Each rotation is specified by an angle of rotation. 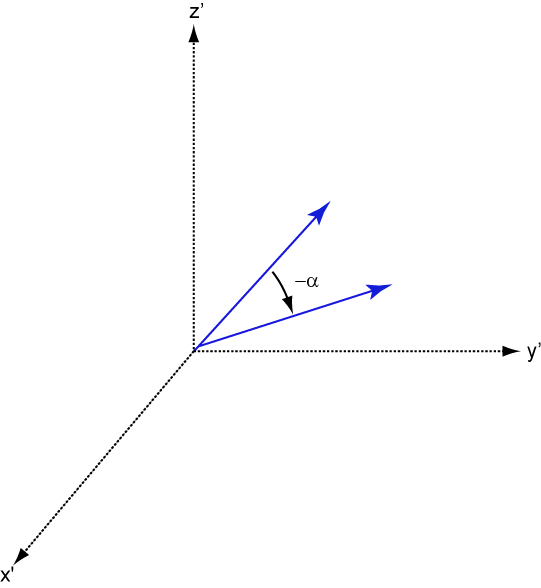 The rotation angle is defined to be positive for a rotation that is counterclockwise when viewed by an observer looking along the rotation axis towards the origin. Any arbitrary rotation can be composed of a combination of these three (Euler’s rotation theorem). For example, you can rotate a vector in any direction using a sequence of three rotations: v′=Av=Rz(γ)Ry(β)Rx(α)v.
This example illustrates a basic property: the inverse rotation matrix is the transpose of the original. Rotation matrices satisfy A’A = 1, and consequently det(A) = 1. 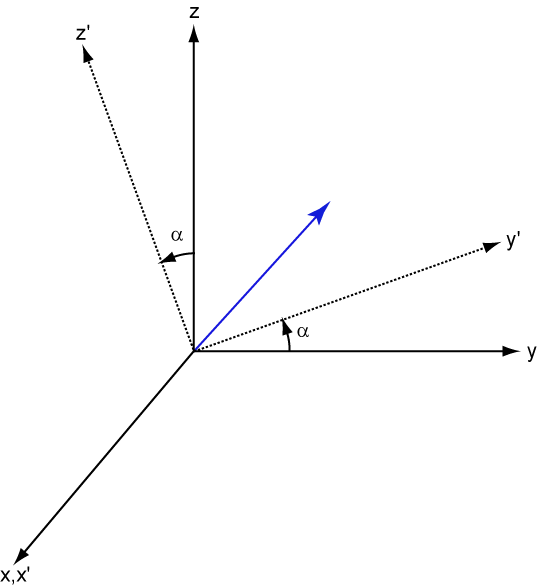 Under rotations, vector lengths are preserved as well as the angles between vectors. Using algebraic manipulation, you can derive the transformation of components for a fixed vector when the basis (or coordinate system) rotates. This transformation uses the transpose of the rotation matrix. The next figure illustrates how a vector is transformed as the coordinate system rotates around the x-axis. The figure after shows how this transformation can be interpreted as a rotation of the vector in the opposite direction. Goldstein, H., C. Poole and J. Safko, Classical Mechanics, 3rd Edition, San Francisco: Addison Wesley, 2002, pp. 142–144.